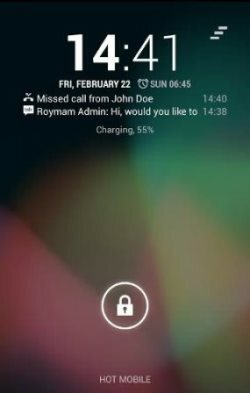 How to Display Notifications on the Lock Screen of Android: NiLS Notifications Lock Screen is an Android app that can show notification in the lockscreen. It only works for handset with Android 4.2 and above. NiLS Notifications Lock Screen is a simple app that does simple thing, but filled a gap that is sorely missed in Android. whether they are SMS, emails, missed calls, alerts Facebook, Whatsapp messages or whatever you have installed on your smartphone. See expanded notifications (for example, the name of the person who sent you an SMS), persistent notifications of applications like calendar, to-do or the weather, among other things. To use Nils Lock Screen Notifications, install the app, run it and then press the “Service” to enable. Then click on “Widget” and follow the instructions. Once you added the widget, it will start showing the notification in the lockscreen of your smartphone. Nils Lock Screen Notifications can be installed on different devices with different versions of Android, but will vary depending on where you try. As a rule running on Android 4.2 (which is a shame, could use older versions). Download: NiLS Notification Lock Screen from the Google Play Store.